Ernie Wise made the UK's inaugural mobile phone call on 1 January 1985. Coverage was restricted to London and costs were prohibitive, but Britain's mobile culture had arrived. Britain's mobile phone users were either very rich or used a mobile in their jobs. When digital arrived in 1992 and two new networks, One2One and Orange, launched their first products a year later, the market opened up to consumers for the first time. How much did mobile phones cost? Mobile phone use spread slowly at first, but gathered pace as prices came down. Whilst there were only four networks in the UK, a large number of companies tried their hand at supplying handsets. Phillips, Alcatel, Orbitel, Nortel, NEC, Panasonic, Mitsubishi, Maxon, Technophone, Swatch, Siemens, Sony and British Telecom are a few of the brands people will remember. However, three names emerged as market leaders, Ericsson, Motorola and Nokia. Motorola, the maker of the world's first hand portable, focussed on attention grabbing, high status products. Ericsson, one of the oldest names in the telecommunications industry, reluctantly entered the handset business in the 80s. However, Finnish firm Nokia's commitment to good design with a human face was the winning formula. If a phone was easy to use, it was popular, but it was also good for the network operator. People were much more likely to use their mobile if it was easy to look up a friend's number, if not, they would use a landline phone. So operators pushed phones that were easy to use. Nokia's commitment to usability gave its phones a significant advantage over competitors. Finally fun and fashion became the important selling factors. Nokia's team of young designers was able to understand and exploit both the young professional and the teenage market and keep their phones the coolest. More recently another firm famous for its design aesthetic and the usability of its products, Apple, pushed Nokia off its top spot. To go back to the beginning, the story of mobile phones in the UK began many years before Ernie Wise made that call. The UK's first mobile phone users were motorists in Manchester. A car radio phone system began in Manchester in 1959. The state owned, General Post Office or GPO, ran the network . Subscribers, as they were called, in South Lancashire could connect for £195 (more than £3000 in today's money). There were only six channels which meant only six calls could take place at the same time and all calls were placed through the operator. There were eighty-six subscribers by 1963, but the GPO made a loss on the service. 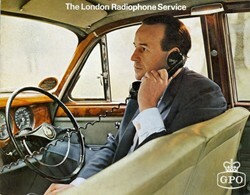 Nevertheless, the GPO persevered with the car radio service. In 1965, the same year as the Post Office Tower (now the BT Tower) opened for business, a new car radio telephone service, called 'System 1' started in London. The Postmaster General made the first call to Richard Dimbleby. Calls cost from 1s 5d for the first three minutes. By 1983, the service was 'System 4' and could handle calls automatically without an operator. It was still highly exclusive as radio bandwidth was a scarce resource. When cellular networks arrived in 1985 car phones remained one of the most popular ways to go mobile. The cost of miniaturising the technology was high, so hand held phones were much more expensive. Powerful car mounted transmitters and receivers could also make the most of the limited coverage. When the Carphone Warehouse was launched in 1989, car phones were the still cheapest way to own a mobile. The problem with the early car phone networks was that there were a limited number of channels and only one pair of people could use one channel at the same time. This meant that the systems being such a scarce resource would always be expensive. Engineers had already come up with a way to solve this problem: the cellular network. Divide the area of the network into cells and imagine that people don't move when they make the calls, then the channels only need to be unique within a cell. If now you allow people to move, essential for a car phone network, you only need the channel to be unique in a one cell and all adjacent cells. When the car moves from one cell to another, some magic, must give the phone another channel in the new cell. That magic is hardware and software which was not able to do this complex switching until the end of the 70s. The world's first cellular network started in Japan in 1979. In Norway, Sweden and Finland, the NMT network opened for business on 1 October 1981. The same technology was used for the cellular network based on NMT in Saudi Arabia which surprisingly became fully operational a month earlier. One of the biggest names in mobile phones launched its first car phone, the Mobira Senator, in 1981. Mobira was a joint venture between Finnish television maker Salora and a rubber and cable manufacturer called Nokia. The next country to go mobile was the USA in 1983. Britain's system was based on the US system, but with certain modifications meaning that our phones would not be compatible in other countries. 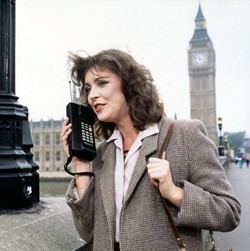 The UK's first hand held mobile phone was the American Motorola DynaTAC 8000X, which debuted in the USA in 1983. They were as large as a house brick, much heavier and as costly as a small car. Britain's mobile phone network system was shaped by government policy. Large corporations were out and competition was in. The GPO, now the newly privatised British Telecom, was not going to be Britain's sole mobile provider. The Government insisted on two networks. The first was a joint venture between British Telecom and Securicor called Cellnet. The second was headed by defence communications specialist Racal and called Vodafone. Vodafone beat Cellnet to become Britain's first mobile network. In those days the cost of a mobile phone meant that they were only viable for businessmen, who needed to be in constant touch with the office. The cost could be justified in terms of saving time. It took another eight years before consumers started to get a look in with mobile technology. GSM was a product European co-operation. In the early days of cell phones different countries went their own way. To business users in Europe this was a disaster, as cell phones would stop working as they crossed borders. GSM officially launched nearly ten years later in 1991. It quickly became the standard in France and Germany, but the UK already had two analogue providers covering the country. However, analogue's days were numbered. The Government had already issued two new licences for mobile network providers on a digital format based on 1800Mhz called PCN. These two new providers were meant to help spread mobile phone use out of the business community and make mobiles for the masses a real possibility. The two new providers were Mercury and Orange. However, the UK's first digital service provider was Vodafone, which started the UK's first GSM network in 1991. Vodafone's very limited service targeted high flying businessmen keen to take their cell phones to Europe. Rather than the beginning of a new service for consumers, the initial GSM network was even more exclusive than the original analogue one. First of the new companies to offer a digital service was Mercury. Their One2One network offered limited coverage, initially in the M25 area only. The service launched on 7 September 1993 with two new phones: the M200 made by Siemens and the M300, a rebranded Motorola phone. Customers of the new network quickly discovered some of the most irritating aspects of digital communications. When the connection was poor it could sound as if you were talking to a Dalek. On the analogue networks you could always speak above the noise on a bad line, but digital voices broke up into metallic twangs. This was not the only issue. Handsets were shoddily made. The plastic broke easily, especially on the battery of the M200 phone. Mercury's saving grace was that it offered free evening and weekend calls. The hope was that customers would see Mercury One2One as a replacement for their home phones. The age of consumer mobile phones had begun. Orange was run by Hutchinson Telecommunications, a giant mobile phone dealer. Hutchinson's executives had their fingers burnt a few years earlier with the Rabbit phone. Based on cordless phone technology, the Rabbit phone, was a cheap alternative to mobile phones. You could make calls if a Telepoint denoted by a upturned R symbol, was nearby. It was meant to be a replacement for the public phone box, but for every Telepoint there were eighty phone boxes. Hutchinson's executives were careful not to make the same mistake. Orange had almost national coverage, excepting Wales, when it launched on 28 April 1994. They also picked better phones. The first Orange phone was a specially made Nokia, a derivative of the smart new Nokia 2110, which was the cutting edge phone of its day. Vodaphone experimented with different tariff levels to lure in more customers. LowCall offered lower handset prices, but higher call chargers to less frequent users. In the Autumn of 1993 they launched MetroDigital as a direct competitor to Mercury's struggling One2One service. MetroDigital offered cheaper phones and offered cheaper calls if they were made from a nominated Metro cell, more expensive calls if from further away. Whilst mobile phones were becoming cheaper, they were losing their kudos. The Motorola StarTAC changed all that. It was the world's first clam shell style phone, a natural evolution of the MicroTAC. Motorola advertised the new phone alongside a credit card, to show its diminutive size. It was no co-incidence that the credit card was an American Express Gold Card. At £1400, the StarTAC was firmly targeted at the Gold Card using class. Whilst the new digital networks convinced some people it was time to go mobile, the biggest deterrent was the contract with the service provider. You had to sign up to monthly fees and call charges. Many people were happy to buy a mobile phone, but did not want this extra hassle. Just as Vodafone pioneered GSM, they were also the first company to offer a pre-paid service on the old analogue system. However, pay-and-go did not really get to be a serious option until 1997 when One2One launched the first digital pre-paid service. By Christmas 1997 there was a choice of three pay and go services: Vodafone 'Pay As You Talk'; One2One 'Up 2 You' and Orange 'Just Talk'. Vodafone offered cheaper analogue phones including the Nokia Ringo, one of Nokia's last analogue phones, for £99. Both Orange and One2One offered just one choice of phone for £179.99. An aftermarket industry sprung up around mobile phones, selling all sorts of gadgets to make mobile life easier. In 1997 for around £40, you could by a BTG 'Aloha Palmtree', a Swatch style see-through case, which could transform a plain Ericsson phone into a fashion accessory. There were a huge variety of other colours and styles to chose from. Unfortunately, to fit most of them you had to carefully disassemble the phone and void the warranty. 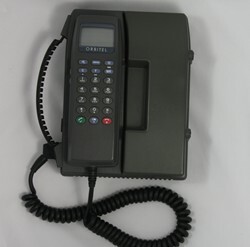 Ericsson went one better in 1997 with the new GA628 which had interchangeable front panels in different colours. However, the phone that captured the imagination of the fashion conscious young consumers was the Nokia 5110, launched the following year with its Xpress-On, fascias. In 1999 the supermarkets starting selling mobile phones alongside fruit and veg. Tesco opened by discounting the price of a basic pay and go phone to £49.99. For that you got a basic black phone: a Motorola C520 on Orange and One2One; a Philips C12 BT Cellnet or a Sagem 815 Plus on Vodafone. Asda then undercut Tesco by reducing its price to £39.99. Once everyone could afford a phone, the race was on the make them buy another one. The latest craze to sweep Tokyo's youth in 2001 was the camera phone. The Sharp J-SH04 was the hot gadget that could take pictures you could send to your friends. UK mobile users got a chance to join in the new fashion, when in 2002 T-Mobile launched the UK's first Mobile Picture Messaging Service. For an extra £20 per month users could send pictures using a new phone, the Sony Ericsson T68i. The T68i, although it supported picture messaging, lacked an essential feature - a camera. You had to take the photographs using a separate camera module. Way back in 2000 service providers shelled out millions for the new 3G licences. The first 3G service '3', owned by Hutchinson Telecommunications of Orange and Rabbit Phone fame, began on 3 March 2003. 3G was slow to take off. Consumer magazine 'Which? ', thought it offered little for the extra money. In 2007, Apple co-founder, Steve Jobs announced the beginning of a new age when he told the world about the iPhone. Apple fans in their millions eagerly anticipated the latest gadget. Today a derivative of this product is still just as attractive. "Very interesting stuff, When I purchased my first GSM handset in 1993. Racal-Vodaphone was the only GSM network available. I was not a high flying businessman, but I did look the part when I took the Nokia 1011 out of my very stretched (if not deep) pockets. "A small but important point. The story refers to Hutchinson Telecommunication. It should be Hutchison (without the 'n').